Inflavet. Natural anti-inflammatory supplement for dogs and cats. Inflammatory gastro-intestinal disease, maldigestion, malabsorption. Farmina Vet Life Gastrointestinal Wet is a complete dietetic food formulated for the reduction of acute disorders of intestinal absorption, for the compensation of poor digestion and exocrine pancreatic insufficiency in dogs. 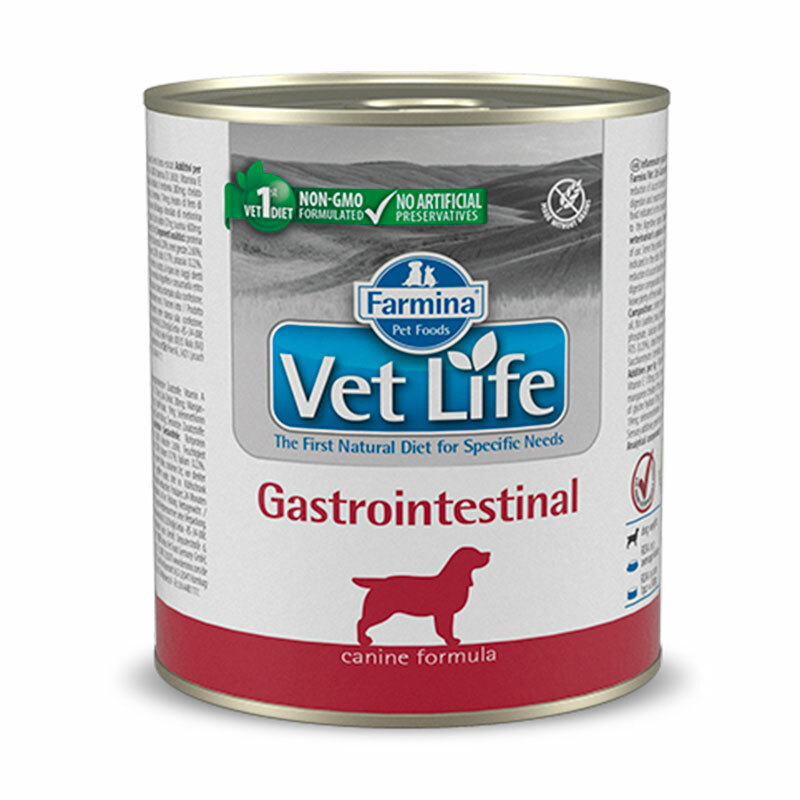 Farmina Vet Life gastrointestinal is a food indicated in the convalescence of dogs that have undergone surgical operations of the digestive organs. Chicken meat, hydrolyzed fish protein, potato, chicken liver, fish oil, fish (sardine and tuna), dehydrated whole egg, quinoa, chicken fat, dicalcium phosphate, calcium carbonate, flaxseed, potassium chloride, fructo-oligosaccharides (0.25%), dehydrated beet pulp, yeast extract (source of mannan-oligosaccharides) (0.15%), sodium chloride, pea fiber, dehydrated brewer's yeast. Nutritional additives: Vitamin A 4290UI; Vitamin D3 260UI; Vitamin E 170mg; zinc chelate of the hydroxy analog of methionine 280mg; manganese chelate of the hydroxy analogue of methionine 114mg; ferrous chelate of glycine hydrate 53mg; copper chelate of the hydroxylated analog of methionine 19mg; selenized yeast inactivated 19mg; anhydrous calcium iodate 0.7mg; 600mg taurine Organoleptic additives: 30mg green tea extract. Crude protein 8.90%; Gross fat 4.00%; Gross fiber 0.20%; Crude ash 2.60%; Moisture 71.00%; Calcium 0.27%; Phosphorus 0.20%; Sodium 0.17%; Potassium 0.22%. We are Italians. As Italians, everything we do centres on the love of the family. In our family food is very important and it keeps us together, and healthy. Love, care from the family and the attention and knowledge of dealing with food is what describes us, and is in our DNA. Family values permeate our work and our history that begins in Italy, more than 50 years ago, by the passion of a man for animal nutrition. It was 1965 when Mr. Francesco Russo founded the Russo Mangimi company specialised in animal nutrition. In that company Mr. Russo raised his children and passed on his values as the engine power of animal wellness and thus the individual. In the meantime the family grew and with it also the company, until in 1999 Dr. Angelo Russo, son of the owner Francesco, driven by a passion for companion animals decided to operate in the pet food category with a new perspective, setting itself the ambitious goal to develop foods that are the result of scientific studies centred on the pet and his well-being. Dr Russo began an ambitious route that drove him to start a collaboration with Farmina, an English company specialised in research and formulation of food for dogs and cats, which brought skills, trademarks and know-how. In a short time the positive customer response allowed the company to invest in technological research and development, and in setting up partnerships with leading independent research institutes as the chair of Animal Nutrition of the University of Naples Federico II. He also constituted Farmina Vet Research: a team of veterinarians and specialists in nutritional formulation that allowed a constant and systematic study of the best foods for the nature of pets, thanks to the feedback that came from dozens of veterinarians with whom Farmina worked in long term cooperative relationships. Growing demand for Farmina products worldwide brought the company to investments on technology and to open new production plants closer to those markets demanding the unique features of Farmina quality.